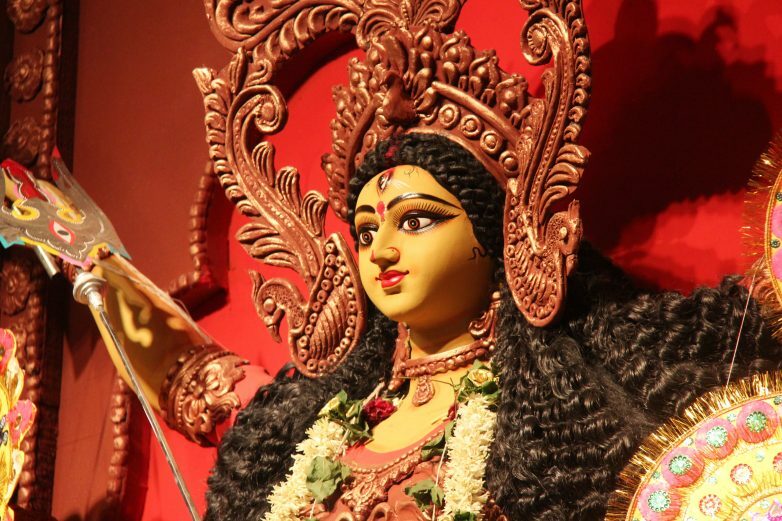 Navadurga or Shakti can be pleased by specific mantra and offerings.Here are the Nine avatars of Shakti and the mantra for each day of Navratri for seeking blessings from them. 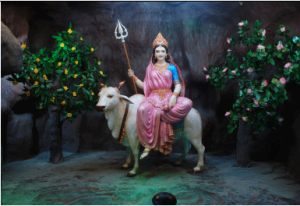 Shailputri is the first form of Maa Durga.Shailputri is a daughter of mountain king Himalaya. She is also known as Parvati, Bhavani, and Hemavati the daughter of Hemavan. 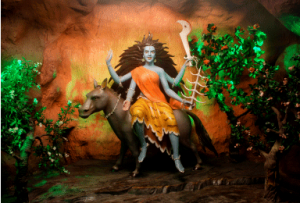 She is the consort of Lord Shiva. She rides Nandi bull. In Puranas, she is depicted with two hands holding Trishul in right hand and lotus in the left hand. Shailaputri represents earth element, Therefore, Shailaputri is the mother nature who is the cause of all the earthly existence. She resides in the Muladhara Chakra. Stabilising Muladhara Chakra is the first step in yogic practice to awaken Kundalini.This is one of the reasons why Shailputri worshipped on the first day of Navratri. Offering pure desi ghee to Maa Shailputri eradicate the illness and disease from the life of devotees. 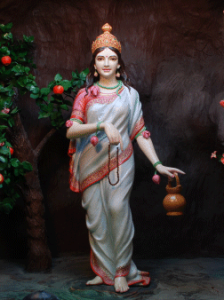 Maa Brahmacharini worshipped on the 2nd day of Navratri. She is portrayed wearing the white sari and holding chanting beads in right hand and Kamandal in left hand. Mata Brahmacharini did hard austerity to get Lord Shiva as her Husband therefore known as Brahmacharini. 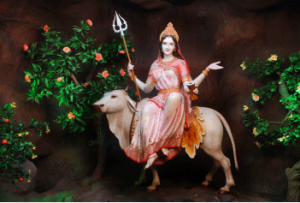 She is considered to be the feminine form of Brahma and seek to attain Vedic knowledge. Mata Brahmacharini is presiding deity of Swadhisthan chakra in the body. An offering of kheer,mishri or sugar is made to Maa Brahmacharini.She bestows devotees with knowledge wisdom and wealth. Chandraghanta is a ferocious and married form of Parvati. She wears half moon on her forehead and has eight hands holding a Trident (Trishul), mace(Gada), bow-arrow, Sword(khadak), lotus flower, bell(Ghanta) and water pot (Kamandal), while one of her hands remains in Abhaya mudra(blessings posture). This charming and fierce form of Durga is pleased by offering milk, sweets or kheer. By her blessings, all the sins, troubles and physical sufferings of the devotees are eliminated. 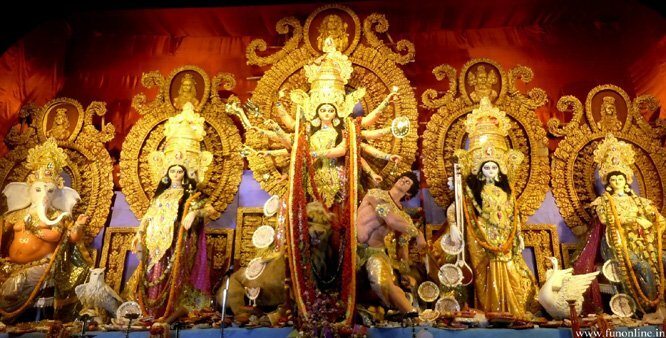 Maa Kushmanda is the Fourth form of Maa Durga. Kushmanda is shown with ten hands holding a trident, discus, sword, hook, mace, bow, arrow and pot of nectar. Her one hand depicted in abhayamudra from which she blesses all her devotees. She rides on a tiger. Maa Kushmanda produced the cosmic egg(anda) by her divine smile. She is the ultimate energy inside the sun and brings light to illuminate the world. Her abode is Anahata chakra. Observing fast and offering the bhog of malpua to maa Kushmanda fulfill all desires of Devotees and increases the intellectual power for right decision-making. 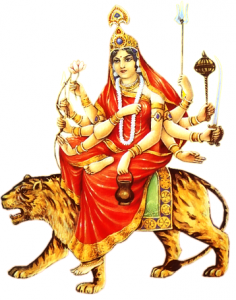 Maa Skanda Mata is the Fifth avatar of Maa Durga, When Parvati became the mother of Skanda or Kartikeya she came to known as Skandmata.She is portrayed with four hands holding lotus and Kartikay in her lap.another hand bless his devotees.She rides the lion. She is a goddess of love and affection. Those who worship her get grace from Mata and her son Kartikeya. Her abode is in Vishuddhi chakra. A Bhog of banana is offered to the goddess. She is believed to improve health and bestow wealth and strength and devoted sadhak of her gets salvation. She is associated with Ajna chakra which is also known as third eye chakra.Concentrating between eyes can invoke her blessings. Offering honey to the fierce goddess is very auspicious. She is a giver of knowledge, courage, and peace of mind. Maa Kalratri worshipped on the Seventh day of Navratri. Kalratri is a most ferocious form of Maa Durga, she is also known as the slayer of the most dangerous demon Chand and Mund, thus came to known as Chamunda.Subhankari is her other name which means she provides auspicious results to her devotees. The complexion of Goddess is extremely dark like night and her hair is long and open therefore known as Kaalratri. 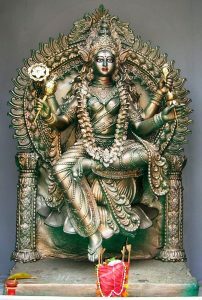 She has four hands – the left two hands hold a khadak and a Vjra(thunderbolt) and the right two are in the Varada (blessing) and Abhaya (protecting) mudras. Kaalratri has three eyes.Her vehicle is a donkey. Sweets made from jaggery is her favorite offering.She provides protection from ghostly hurdles, evil spirits, and negative energies. 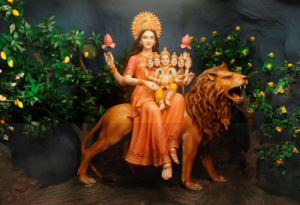 Mata Maha Gauri worshipped on the eighth day of Navratri. She has an extremely fair complexion, due to this reason she gets name Maha Gauri. She is beautiful and charming.She has four hands and three eyes. 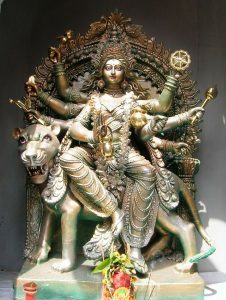 Two of her hand holds trident and tambura while other two are in Varada and Abhaya mudra.Her mount is bull. Offering coconuts to Mahagauri fulfill all desires of devotees.The childless couple if donating coconut to brahmins especially on this day get blessed with a child by the grace of Goddess. She is seated on the lotus and has four hands occupying mace, lotus, Sudarshan chakra and Sankha. An offering of till is very auspicious as she removes all hurdles from the life of devotees and grants siddhi. Sadhak who seek divine knowledge and salvation worships her. Thanks a lot for your feedback.I’ll surely do that. Very informative post. Thank you for posting. Nice religious read, keep up the good work Shikha! Thanks for the appreciation.It means a lot to me.